Please be on the lookout for a pink letter from the Parent Teacher Committee. You may find it in your child’s take home folder and if not, please pick them up from your child’s teacher during conferences. It is about Teacher Appreciation Week. Regarding the security discussion from last week, I would again like to thank all the parents who voiced their concerns and suggestions last week. I presented your messages to the board at the last meeting, and I think it helped bring this issue onto the radar, so to speak. InshaAllah I will keep everyone informed of any progress made in this regard. Thank you for signing up for parent teacher conferences. No classes tomorrow (April 12) – have a great weekend! – please ask authorized pick up persons not to be offended if the teacher asks their name. Not all teachers or substitutes will know or recognize each child’s parents. – if someone else is picking up your child, please email ftsattendance@icnmasjid.org or call the school ahead of time to let us know. – report any suspicious vehicles or persons to myself or Ms. Farhana. Welcome back from spring break! I hope you all enjoyed your vacations and “stay-cations” last week. I asked your input about security at our school this week. Thank you for responding with your honest feedback and your suggestions. InshaAllah I will convey your messages to the board this weekend. Allow me to also tell you the measures we currently take toward security. FTS has an active shooter policy. We receive ALICE training (and refreshers) from the Naperville Police Department. We do our best to monitor who enters and exits the building during school hours,and try to enforce that Musallis come during Salah timings only, however, since the property is used as a masjid as well as a school, we must be extra cautious in monitoring this. Again, I will take your questions to the authorities, who will better be able to address cost implications, logistics, community needs, etc. We pray that by Allah’s mercy and protection we never have to face an active shooter situation, and in the event that we do, May Allah protect us and guide us to take the necessary steps to protect those under our care. Have a great weekend, wassalaamu ‘Alaikum. Enrollment for Fall 2019 is open. Registration fees for currently enrolled families can be deferred until June. The students are all ready and very excited for the All School Program tonight. The stage has been set, and we are looking forward to seeing you all soon! Among the other events that are coming right up, is one that I would like to highlight in particular. 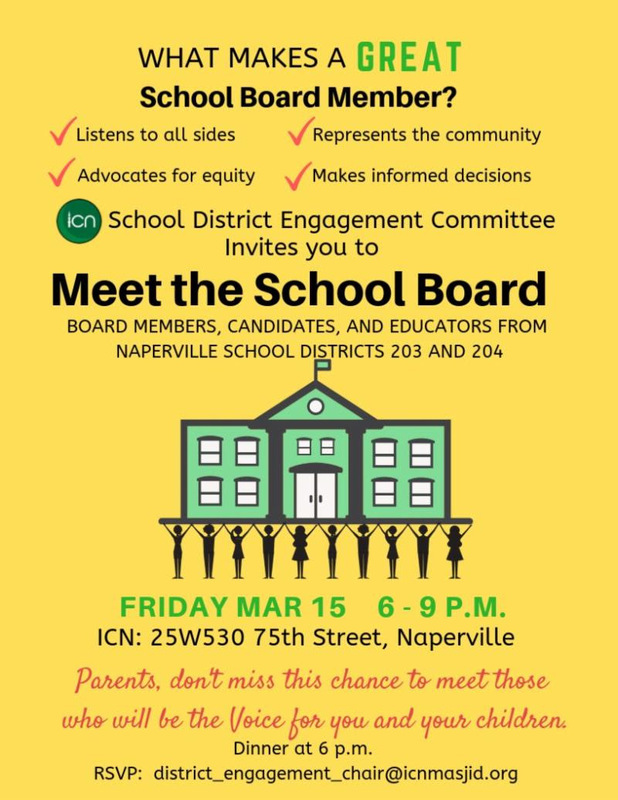 ICN’s School District Engagement Committee invites you to meet the school board and school board candidates for districts 203 and 204, next Friday, March 15th, at 75th Street. Please RSVP to district_engagement_chair@icnmasjid.org. Parents are encouraged to submit questions for the candidates and board members using this same email address. Dinner is included but please RSVP to help the organizers with accommodations. We have had some near misses with traffic during morning drop off time! Please be vigilant about entering from the second (farther) parking row when you come to drop off your children in the mornings. We realize the traffic cones blocking the bus entrance can be inconvenient, but remember this is for the safety of our own children. 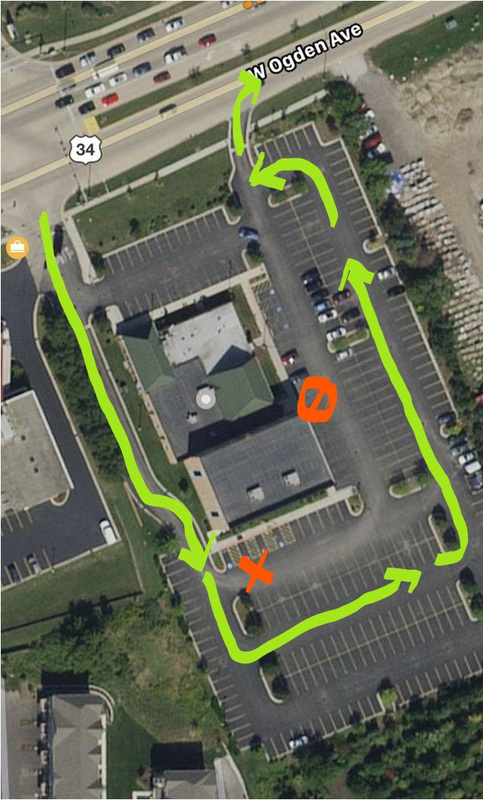 We request exiting the parking lot from the “right only” exit that goes out to Ogden Ave. For reference the original traffic map is attached. It still feels like winter, but spring is just around the corner, and so are so many events and activities! Did I mention it was going to feel fast? The All School Program is next week, and we need some help in setting up the backdrop and art work. We are hoping for some dedicated dads to please step forward to volunteer. If we can get 2 to 3 dads to help us out next Thursday evening after Isha prayers, we would truly be grateful! Please email me at mali@icnmasjid.org if you can help us. On March 15th, ICN’s School District Engagement Committee is hosting a “Meet the School Board” event, as mentioned in last week’s newsletter. So who are school board members, and what do they do? Please attend to find out. This is relevant to all of us who have students who will enter districts 203 and 204. Some of our students already have older siblings in these districts, so it is all the more relevant. The invitation is open to everyone in the community. RSVP’s can be sent to district_engagement_chair@icnmasjid.org It would help in making sure there are enough seating and dinner accommodations. There is no school tomorrow due to County Institute Day, so enjoy the weekend, and see you on Monday! Thank you and Salaamu ‘Alaikum. Please use the email address ftsattendance@icnmasjid.org for reporting attendance / late arrival / early pick up / non-parent authorized pick up. We request that you inform the office ahead of time when picking your child up early, and also ask that anyone who picks up students outside of regular dismissal time wait in the office for a teacher to bring the student to you. Please plan to stay in your vehicle until the doors unlock at dismissal time. The bathrooms may be used after the doors are unlocked, at 2:50 p.m. Thank you for helping us in our efforts to maintain security protocols. You may also feel free to inform community members to try to stick to ICN’s scheduled jamaat timings when requesting to enter the building during school hours. This week I had the pleasure of attending and speaking at School District 204’s PDAC meeting. PDAC stands for Parent Diversity Advisory Council and is an organization that includes school board members, administrators, educators, and community members of the public school district. This month’s topic was about the positive impact that parental involvement can make in our children’s lives throughout school and even beyond. Being involved in your child’s education can include volunteering at school, but there are many more ways that can also have a lasting impact, and one of them is to be involved at the planning and policy level. Enter ICN’s new initiative: The School District Engagement Committee. The mission is to advance our community’s representation in local school districts by participating in their diversity outreach programs. The first event that this committee (of which I am also a member) is planning is a “Meet The School Board” event on Friday, March 15th. It is important to know and have a say in choosing the people who make the policies and oversee the administration that is responsible for our children. I encourage you to attend. Please see the attached flyer for details. Friday, March 8: All School Program – please save the date and reserve the timings in your schedule! When you arrive, please wait in the office and a teacher will bring your child to you. Please also inform any family members or caregivers to also wait in the office for your child. REGISTRATION: Enrollment for Fall is open! We are accepting registration for two locations: Ogden and 75th Street. Please spread the word to anyone you know who has preschool and kindergarten aged children. Current families may defer the registration fee until June. Thank you. We are already half way through February, and looking forward to the All School Program in March, so please mark your calendars. Boxed dinners are available for ordering, if you wish to stay around for a little while and eat after the show. Please save the date for Friday, March 8th, from 5:45 pm until 7:30 pm. The program will be in the school gym. The RSVP / dinner order form was sent home in today’s folders, so please be on the lookout for it. A big thank-you goes out to all Pre-K parents and volunteers this week, who sponsored or made the items for the bake sale, set everything up, and managed the sales all day today. The fresh dosas were a hit mashaAllah! Next week we look forward to the winter field trip to the Dupage Children’s Museum inshaAllah. It seems a bit early to think about summer right now, but Naperville school district 203 has asked us to forward some registration information about their summer programs in case any of our district 203 residents are interested. The programs range from Kindergarten through high school. Below are some registration links. Their deadline to register is May 24th. Thursday, February 21: Field Trip to DuPage Children’s Museum – Pizza will be served for hot lunch after the field trip (this is a make-up hot lunch for the one we missed because of the snow day a couple of weeks ago). REGISTRATION FOR FALL 2019-20 IS OPEN. Students are enrolled on a first come first serve basis. For currently enrolled families the registration fees can be deferred until June, so all you need to do it complete and submit the forms to lock in your child’s seat. The deadline to submit dinner orders for the All School Program is Tuesday, February 26th by 2:50 p.m. Welcome back! We hope all our families enjoyed a fun, safe, and healthy winter break. I would like to pause at this mid year point to express gratitude for the blessings, successes and even challenges that have helped us grow together as a team of parents and educators. I hope and pray that you feel equally a part of this special team, and that Allah blesses us with unity and many successes in the months to come. With these sentiments we begin the second semester of the school year. There are lots of events coming up so hold on to your hats – It’s going to feel fast! Thank you for keeping your children home if they are sick or possibly contagious. Please keep school health guidelines in mind as we continue going through cold and flu season. There have been no reported cases of headlice since returning to school after winter break. However, because there was a report a week prior to the break, I am sending a reminder to check for lice and nits as a precautionary measure. Although head lice do not carry disease, nor are they caused by “dirty” hair, they can be a nuisance. We hope everyone enjoyed the snow day this week! I apologize for the delayed emails that have caused so much confusion lately. My group emails have been getting stuck somewhere in the cloud, to be delivered two days late. Thank you for your patience as we work to get this resolved. In the mean time, I have asked Ms. Farhana to forward my messages to all of you. December will be busy but in a good way, with lots of parent events! We hope Dads and Moms will be able to join the fun on their special days. ICN Community Dinner (7 p.m.) and Town Hall Meeting (After Isha / 8 p.m.) this Friday, November 30, 2844 W. Ogden Ave.
We hope everyone can take advantage of conferences this week. Please feel free to browse the book fair while you wait, or to drop in on the Quran, Islamic Studies, PE, and Art teachers, for a walk-in conference. Next month we look forward to the first bake sale of the school year. Kindergarten parents are flexing their bake sale muscles to raise funds that can be used to benefit their classroom! Pre-order forms will be coming home soon. If you’re looking for something exciting to do on October 31st, ICN Al Falah Academy has opened up their Family Fun Night to the community. Click on the link below to register for an evening of bowling, laser tag, pizza, and more at Main Event. And if Main Event doesn’t have enough halal food options for you, then save the date on November 10th for a fundraiser at Al Quds Restaurant, right across the street from ICN! Our own PTC parents have coordinated this event, and 10% of all sales will come right back to ICN Full Time School. Just mention “ICN Fundraiser”. Please remember, no classes tomorrow. Have a wonderful long weekend!